When we talk about "Texas English", of course we don't mean that there is just one Texas English, or that English in Texas is the same wherever you go inside the state. As with many things, there are several ways to skin the cat of dialect diversity within Texas English. One way of looking at dialect differences within Texas is to consider regional variation. Typically, we would expect West Texas and South Texas, along the national border, to be distinct dialect regions, with East, Central and North Texas showing up distinctly depending on what feature was being studied. 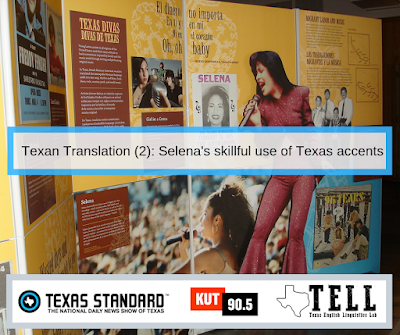 Keith Walters presents an initial approach to dialect variety in Texas in the Handbook of Texas Online (tshaonline.org). It shows utterances with interesting vernacular features that linguists from the Yale Grammatical Diversity Project have overheard and collected over the years. This is of course intended only as a first stab at dialect diversity; linguists at Yale, UT Austin, and other places are working with great amounts of data and conducting rigorous comparisons among places. 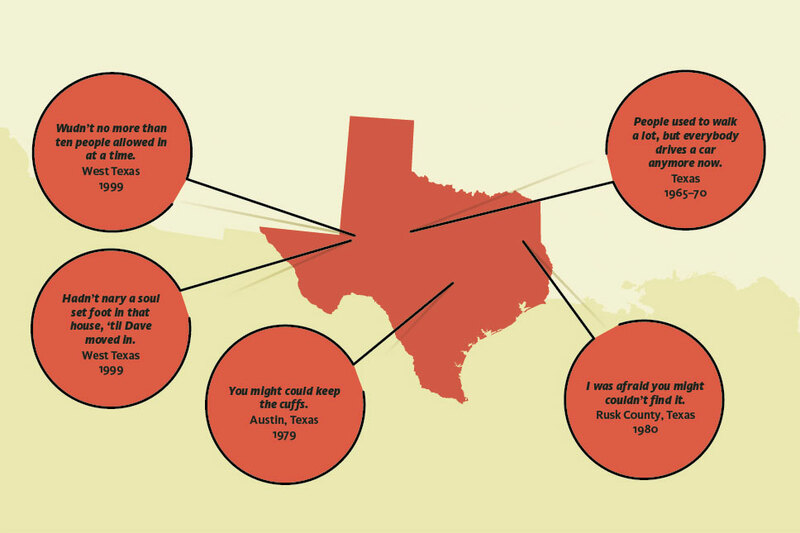 Another approach to Texas dialects is to consider the history of immigration of each place. The native language of early waves of immigrants typically has a strong shaping influence on the later language. The following map, also shown in Walters' article, shows ethnic heritage for Texas by county. Another factor influencing the speech of a place, equally or even more important than geography, is social class. For example, Central Texas is usually thought of as a fairly homogenous region that forms part of the "Texas South" of American dialects (see the Atlas by Labov, Ash & Boberg 2005). But Austin, the city at the heart of The Heart of Texas, is not fully part of the phonological profile of the region. Most likely, this has to do with the relatively high place that Austin holds on the socioeconomic scale, where many Austin speakers don't use all of the features of the Southern Vowel Shift.